It’s now fall and Melanie is now making about 400 simoleans in royalties, so she is treating herself to a night out with Angelica. New in Aurora Skies is Disco Nights! – the hottest (and only) disco club for miles. The first thing Melanie did when she arrived was wish to get a drink. And then another. And then three. I think she’s becoming a budding alcoholic. Don’t you want to go roller skating or dancing with Angelica? She’s waiting downstairs all by herself. But finally Melanie went downstairs. Melanie and Angelica chatted for a while before hitting the dance floor. 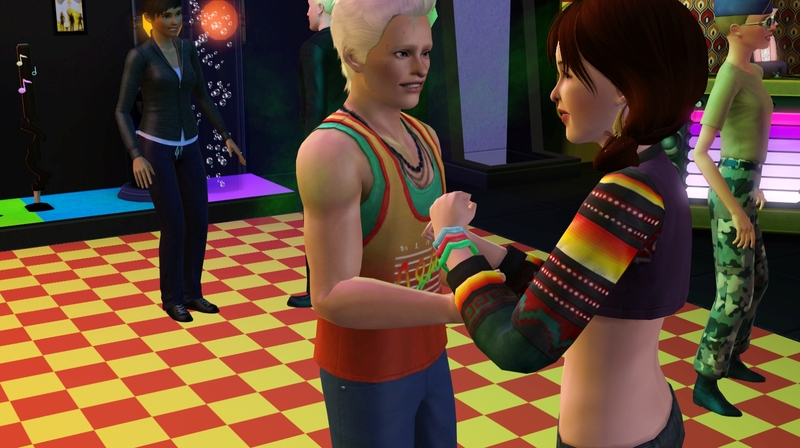 They danced for a few sim hours before Angelica had to make a hasty exit. But before she left, she gave Melanie a hug and was promoted to her best friend! Hmmmm…well I wouldn’t say that. Yes. That’s it. Fate. But maybe this time you’ll go and properly introduce yourself to him. Maybe it was the alcohol or maybe it was his adorable face, but Melanie found herself dancing with this guy until the early hours of the morning. Did you at least get his name this time? The days of sleeping in the kitchen are now over. Melanie had just enough to make the necessary expansion (and I mean she was down to about 50 simoleans). This is probably the house that will stay until she brings home a spouse and a second source of income. 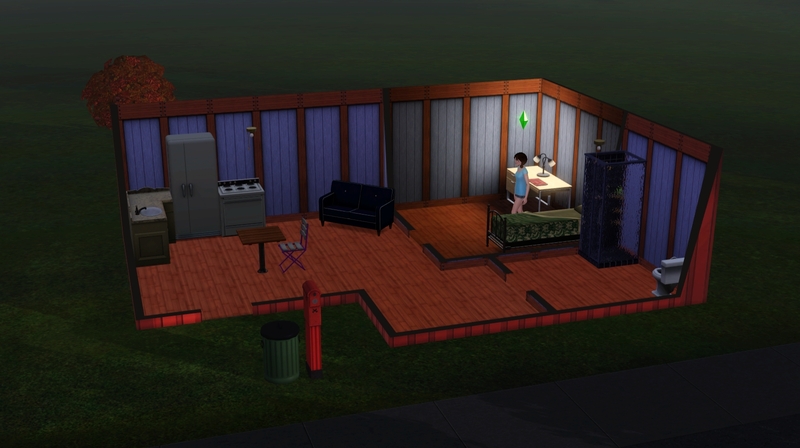 This entry was posted in generation 1 and tagged aurora skies, cultracy, generation 1, legacy challenge, melanie pease, sims, sims legacy, the sims, the sims 3, ts3. Bookmark the permalink. Jakob is certainly a cutie and he seems to like Mel, which is important. Did you make him? I only ask because you are aloud in my challenge. Alright! Jakob is a cutie! Loved this one. Hehehe Jakob is a cutie ;) I love autumn in the sims, Spooky day is so cute!! I almost never get trick-or-treaters. And I hardly ever get trick-or-treaters either so I was actually really surprised and happy when it happened.